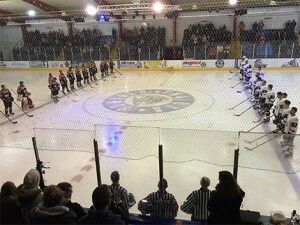 The eyes of the British ice hockey were upon the SilverBlades Gillingham on Sunday night as the Wightlink Raiders made an emotional final outing in a 5-3 defeat at the hands of the Invicta Dynamos in the NIHL Southern Cup. Having iced against the Raiders in their first ever game 19 years ago it was an unfortunate honour bestowed upon the Dynamos as they played hosts to Wightlink’s swansong nearly two decades later. To their credit the visitors travelled at full strength baring the absence of Vaclav Drabek that fittingly allowed Coach Jeremy Cornish to lace up his skates one final time. Meanwhile the Mos were still without six – Tommy Ralph, Taylor Wootton, Steve Osman and Callum Fowler now joined on the injury list by goalies Damien King and James Richardson meaning an unexpected return to the fold for veteran Glen Rodbourne. Nathan Gregory started between the pipes for the Raiders who were given a guard of honour by their hosts as they entered the ice. With the result set to be expunged from the record just seconds after being finalised it was perhaps no surprise that the encounter was played at challenge game pace with skill and passing at the forefront and the physical aspect largely taking a back seat. In the early moments both Jaroslav Cesky and George Norcliffe were denied the opening goal by Mos shot stopper Glen Rodbourne before the visitors found themselves down a man with Chris Cooke in the box for tripping. The Mos powerplay, having improved massively in recent weeks, immediately took advantage – 09.35 the moment when Elliott Dewey’s shot from the blue line hit the pads of Nathan Gregory allowing Haydn Wootton to steer the rebound beyond the netminder’s leg for 1-0. Rodbourne then halted a quick-fire double from Nick Compton to preserve that edge before Adam Rehak countered by dancing beyond four Raiders and flicking to the back post but there was no-one there to meet his pass. A solo skate from Josh Condren also saw him break clear but Gregory shifted a pad in the way of his close range shot leaving the deficit at one with 20 minutes gone. The second period was just over a minute old when the Dynamos increased their lead – Ondrej Zosiak going coast-to-coast and flicking low inside the near post from close range for a great solo strike at 21.05. Meanwhile the Raiders were struggling to reply – Glen Rodbourne shutting down a Jaroslav Cesky one-timer from the left circle and another through traffic from close range to keep them at bay. Eventually the import found a way through at 30.35 – Sam Cheema’s blue line slapshot tipped in front by the Czech forward to cut the lead to 2-1. The Mos answered strongly as Zosiak landed a thumping hit on Richard Nembhard before Bailey Wootton’s shot fell to Anthony Baskerville at the back stick but the speedy skater was unable to convert. The hosts had their third at 38.26 – Nathan Gregory giving up a rebound following Adam Rehak’s shot from between the circles and Ashley Jackson was on hand to follow up at point blank range for 3-1. However it was 3-2 at the break – Cheema claiming another assist as his pass form the left wing was prodded beyond Rodbourne by the waiting Ryan Webb at the near post come 39.45. The final period began with both netminders in stubborn form before a flurry of goals as the final buzzer approached. Goalie Glen Rodbourne defied his years by almost performing the splits to keep Jaroslav Cesky at bay whilst Nathan Gregory prevented Ashley Jackson doubling his tally with a backhand right in front. The home fans were then willing Anthony Baskerville to convert on the breakaway but his shot to the top far corner was gloved by the goalie to dash his hopes of a first Mos strike. Eventually the night’s sixth tally came – the clock stopping at 53.52 after Adam Rehak skated clear and turned Gregory inside out with two quick stick shifts before calmly slotting over the line for 4-2. At 55.34 the forward had another – the netminder saving his first attempt from the slot but having no answer to his second from the edge of the crease that made it 5-2. However, perhaps fittingly, the final goal of the game belonged to the Raiders – Corey Watkins rounding the back of the net and picking out Alexander Sampford in front who swept beyond Glen Rodbourne to make the final score 5-3. Determined to add to the entertainment value, Mason Webster and Danny Ingoldsby ditched the gloves at the restart – Webster landing a barrage of unanswered blows for nearly half a minute before the linesman jumped in just as Ingolsdby mustered a reply. It was a points win for Webster though kudos goes to his opponent for staying on his feet. So it was two more cup points for the Dynamos at the final buzzer that were no sooner added than eradicated as Wightlink withdrew from all competition. The focus of the night was rightly the Raiders last stand and the whole team were given man of the match honours and treated to chants of ‘Raiders’ from all sides of the SilverBlades before making an exit all of the hockey community hopes is temporary. Meanwhile Glen Rodbourne took the spoils for the Mos – a 91.89 save percentage an excellent return having been thrust from the stands into the action in the space of just a week.